This sweet Mini Cuddlekins stuffed chipmunk is cute and cuddly with soft fur of rust, white, tan, and brown. With a huggable body, fluffy brown tail, signature chipmunk stripes down the back, and warm brown eyes, this plush chipmunk is ready for hours of imaginative fun and adventure. This adorable Wild Watchers stuffed chipmunk has amazing, watchful eyes and soft brown fur with black undertones. 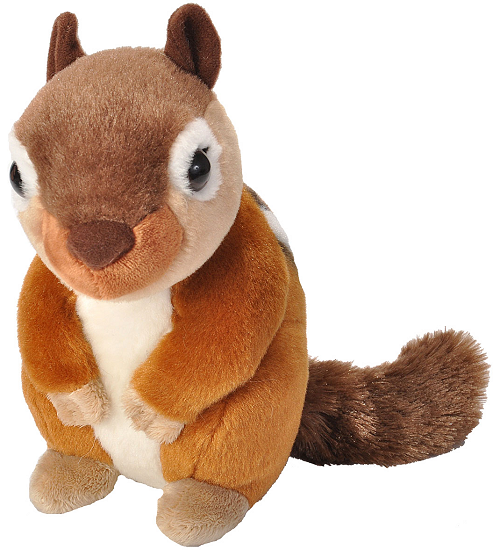 Chitter, this adorable plush chipmunk, has soft rust fur, a huggable body, and fun fluffy tail. Nutsy is a huggable plush chipmunk with soft tan fur on a chunky body and amazing oversized white feet. This adorable little Handfuls plush chipmunk has a soft light brown body with black and white stripes, fluffy black tail, and sweet smiling face. This cuddly Mini Cuddlekins plush cottontail bunny has super soft brown mottled fur which lends to its signature gray-brown look.